The temperature may have been close to zero, but Alexander Palace in North London was really hotting up when it hosted the annual Bet Victor World Championship of Ping Pong on 26th and 27th January and PongCrazy were there to get the ping pong party started with some of our unique tables. 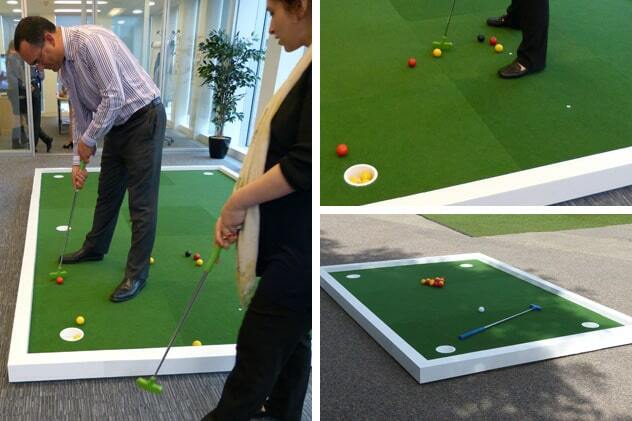 As well as our old favourites, like our giant fried egg (Sunny Side Up) and our golf themed table (Up and Down), we also brought along some new and exciting tables to the Palm Court. The chessboard table (Checkmate) was ‘king of the castle’ and our illuminated egg timer, TimeTaBall (geddit!) was also a hit with its bed of ping pong balls and flashing lights, but the one that really ‘court’ everyone’s eye was our ‘smashing’ tennis themed table tennis table simply named TennisTable. Throughout the weekend, adults and children alike enjoyed playing on our tables, and practising their skills and even some of the professional competitors came along to put our tables through the paces between games. The World Championship of Ping Pong tournament is now in its 7th year, and is promoted by English sports impresario, Barry Hearn and his Matchroom Sports company and he himself was there to cheer the players on. With 64 players from 20 countries hoping for a shot at winning the $20,000 prize money, the action was fast and furious throughout. Although to the untrained eye, ping pong and table tennis are very similar, there are actually a few key differences. Whereas table tennis uses rubber backed bats, ping pong uses an old-fashioned wooden paddle covered in sandpaper which helps with the speed of play, and helps to encourage longer rallies, and adds to the excitement of the game. Excitement was most definitely the name of the game when it came to the final on Sunday evening. Defending champion, Wang Shibo from China, took on home-grown talent in the shape of Great Britain player, Andrew Baggaley in a match that was really edge-of-your-seat stuff. For Baggaley, his journey to the final was not an easy ride, and he had to play every previous World Championship of Ping Pong champion to get there, but having won the championship twice before, in 2015 and again in 2016, Baggaley was hoping that 2019 would be the year to make it a hat trick. The only other player to have achieved 3 championships is Russian player and PongCrazy pal, Maxim Shymrev. Both competitors played hard throughout the match, making the atmosphere in the arena electric, but Baggaley was determined throughout and managed to just take the edge beating Shibo 3 games to 2. A well deserved win to Baggaley and an excellent competition all round featuring some amazingly skillful and entertaining players. We can’t wait to do it all again next year…! Checkout the official website and make sure you get your tickets in good time! 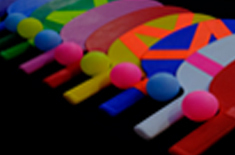 If you would like to bring a bit of PongCrazy-ness to your event, then why not get in touch with us for more details and if you want to know more about the ping pong tour or even thinking of having a go yourself, get in touch with our friends at TopSpin on 020 8279 4099 who will kit you up, quoting ‘PongCrazy‘. Have you seen our newest game yet? DartsCrazy is a hybrid of golf and darts and is the world’s largest target-based game of its kind, playable in numerous formats. It can be hired for all manner of functions, be they corporate, public or social and is perfect for team building events, promotions or even as an ice breaker at your wedding! Our Jon’s brief was to make a pyramid of golf balls “like the Ferrero Rocher tower with a tunnel through it” for a minigolf obstacle. With this the thoughts and opportunities spiralled with the different choices we had. Starting from the geometry of the Great Pyramid of Giza (51.5° side angle) and a maximum footprint size, it was time to play with some ideas to see the scale this beast would be. The World Adventure Golf Masters was contested for the seventh time in its history last month and this year the venue was Zaton Holiday Resort, Croatia. Proudly supported by UrbanCrazy, Great Britain was represented by two teams in the two-day competition with the squad comprised of a blend of experienced players and international debutants who were up against representatives from many countries including: Germany, USA, Japan, New Zealand, Russia and Ghana. Last Thursday’s Clare Balding Show featured twice Olympic rowing gold medallist, Helen Glover, former F1 World Champion, Damon Hill and the popular and charismatic pro golfer, Andrew ‘Beef’ Johnston. So in honour of Beef’s imminent appearance in The Open Championship at Royal Birkdale, Clare and her production team decided to organise a putting challenge between herself and all the guests and turned to us at UrbanCrazy to set up an extra-long hole in the studio, with some rather unusual obstacles. So who won the putt-off?